In association with Vincent Kreugel, a Dutch architect (I detail at the end our respective contributions), we have been expanding on a pentagon tiling as apparently first devised by Marjorie Rice. Rice is famous for pentagon tilings, having found three new types of convex pentagons in the mid to late 1970s. An excellent article on the pentagon problem is Doris Schattsneider’s ‘Tiling the Plane with Convex pentagons’. Much of Rice’s investigations remain unpublished, in that only the product of her investigations are shown. How she devised these is not generally shown. However, some of her investigations are indeed shown in The Mathematical Gardner, a compilation of articles in hour of the late Martin Gardner, with Doris Schattsneider’s article ‘In Praise of Amateurs’ (mostly concerning background detail on Rice’s pentagon tiling findings), pages 140-166. Pages 154-155 contain numerous convex pentagon tilings, of which one of the tilings, or more precisely the tile, is the subject of this page. Unfortunately, the reproduction is at such a small scale that the annotations are barely discernible and so referring to these directly is difficult. Also, the drawings are hand drawn, and so matters of accuracy arise. To ease matters, for the sake of general convenience I show the Rice tilings below, of a type 1 convex pentagon (complete with shading for mirror image tiles), Fig. 1a and Fig. 1b. 1a correlates to Rice 4c, whilst 1b is the diagram to the extreme right of 4c (the text is illegible). Both these diagrams appear to be of the same pentagon (again, it’s difficult to be certain, for reasons as detailed above). Simply stated, two different stackings of the same pentagon by accident or design are shown (although no reference is made to this feature in the article). Note that no claim is made as to completeness; indeed, I would not be surprised if there are other ‘configurations’ (made of larger blocks of greater unit thickness) below. The nature of the study militates against a systematic analysis of all possibilities. However, a start at least has been made in determining the basics, of which here I am on firmer ground; I believe that the basics are indeed in place. The most trivial are the tilings as strips, Type 1. l as any strip can be slid length ways (i.e. as a non edge to edge tiling), and furthermore can be added to by inserting other strips. Six core instances are shown. That said, even with this ‘lesser’ type, there still remain of interest. Another instance of relative triviality is that of the ‘extendible’ type, Type 2. Many of the tilings can be interpreted as of forming a four-unit 180° rotational block, noticeably those with all parallel sides (other blocks are also possible interpretations, although less intuitive; one has to seek those out, which the parallel instances are more obvious). Of this (parallel side) 180° block) type, these can be ‘extended’, by the insertion of a 2-unit block, thus leading to an infinity of such tilings. Describing this is perhaps not ideal; the diagrams make clear the intention. Spiral, type 5. a six unit block is at the core, from which a spiral stature can b seen the colouring brings out the spiral structure, totally unexpected. This is the only instance of this type that has been found. Are there others? Radial, with the addition of an inner regular pentagon. The addition of the regular pentagon could be argued as a digression. Although the construction of the individual tile is not given, it can be seen to be most simple, of a regular pentagon, with a side extended and of a parallel line to the side, Fig. 2. As an aside, for such a simple construction/concept, indeed, childlike in its ease of finding, it seems surprising that it was not until 1975 that this tile was discovered. Does anyone know of any earlier instances on this? Or indeed, of any subsequent work? Type 2. An ‘extendible’, 180° block, in which a core 2-unit block can be added to extend the block. Somewhat curiously, it can be seen that Type 5a is the same as Type 7a. From this, one might expect that there would be an echo here of the respective types i.e. Type 5b is the same as 7b; 5c is the same as 7c, but this is not the case. Quite what explains this feature is unknown. A feature of the Rice type 4a is that the tiling can be varied, and not just ‘extended’ as above. A sloping column of the underlying 4-unit block is given, at left. Any of the three blocks in pink can be seen to tile, leading to infinity of tilings of any combination desired of this procedure. Many of the above can be seen to possess the 2-unit block in green, from which this can be inserted time and again, and so extend the block to infinity. Note the curious spiral form that wraps around the inner block, the only instance of this type found. Although the spiral is admittedly 'weak', in that this is only apparent in a vertex to vertex arrangement (as against ‘strong’ in a tiling of contiguous tiles). Furthermore, as the 'inner core' tile can be extended, so can the spiral. An open question is to the number of tilings possible; as such, I have not discussed how the above were formed. The most obvious process is to take a pentagon and find out all the possible ways of joining, as a 2-unit block, and then seeing which, if any of these tile. In principle, this can be extended to, 3, 4… unit blocks. However, the number of tiles increases exponentially with each successive increase; even calculating by hand for 3- unit is only just practical but even so, I have not done so, as a rough calculation shows that the numbers are too large (never mind the actual drawing), possibly approaching 1000 blocks. I could do this, but the time involved is judged too excessive. Simply stated, such combinatory matters are a task for a computer. However, as alluded to above, I have indeed computed for the 2-unit instances, of which there are a set of 34 ‘all possibilities’, of which not all distinct; omitting the repeat instances gives a set of 21 distinct. One could then continue with this core set, forming 3-unit blocks. However, as alluded to above, this is right at the limits of practicality, and of which I refrained from doing by hand; the time involved is simply too great. An alternative, quicker, more practical continuation is that of forming blocks with a likely tiling possibility that is forming tiles with parallel sides. To do this, all one has to do is take a member of set of 22, and ‘pair’ it in turn with the set. This is more ‘intuitive’, and can be done with speed and ease. Many blocks are formed that obviously will not tile, and so can in effect be discarded, but some do indeed form blocks of parallel sides that do at least offer the possibility of forming a tiling. Indeed, this is how the Type 2 tilings above were formed, of which it was later observed that they could be ‘extended’. As can be seen, the construction of Rice’s pentagon tile above is most simple and straightforward, and surprisingly for such a simple, core value tile, not apparently been discussed before in the literature (has anyone seen this?). By any stretch of the imagination, this is an ‘interesting’ pentagon, given the numerous ways it tiles. An open question is to whether there are any other pentagons of a like ‘simple’ nature that may also tile in such ‘interesting’ ways, and if so, how to devise these? As alluded above, Rice’s pentagon is derived from a regular pentagon, and can be described of as a side produced and a side of a parallel line. As a variation of the theme, more pentagons can be devised by this ‘produce and parallel’ procedure. Upon taking a regular pentagon, producing and extending all the sides as according to these two rules, from an irregular star decagon as in the diagram as below. Other pentagons, with a little imagination, can be seen to be embedded here. Furthermore, in the search for even more pentagons, one can join the outer vertices, thus forming an irregular decagon diagram. Again, even more pentagons can be seen embedded here, of which I now investigate. As with Rice’s pentagon, I have not seen these discussed in the literature, has anyone seen these anywhere? 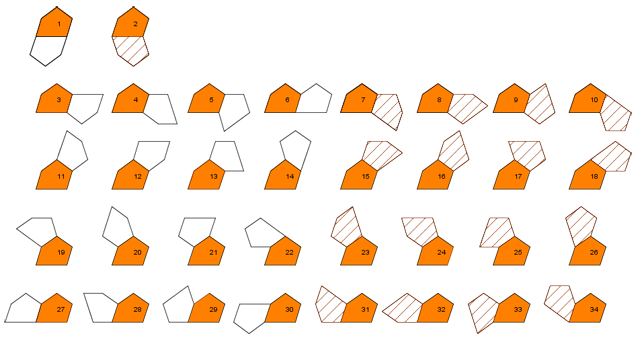 Figure 18: Set of 19 Pentagons with underlying construction. Now, do any of these pentagons tile, and if so are there any ‘interesting’ types? As such, the same procedure for finding tiles as above can be adopted, with 2-unit blocks etc. To a degree I have studied this, but as can be seen by my struggles above, unifying this satisfactorily is a Herculean task. This being so, I show a arbitrary selection of tilings. Among the many of the tilings that have more than one placement here that can be described as ‘interesting’, tile 8 is perhaps of even more interest than most. Of note is that a core unit can tile in strips, b-d, and of which when rotated 180°, due to the asymmetric tile, can tile in an uncountable infinity of ways. Putting this into words in not a straightforward task, due to the intricacies involved. Much better is a picture, from which one can see the premise. Tile 18 can be said to tile in essentially two different ways, Type 1, with a single instance, and Type 2, a-c, with ‘uncountable infinity’. 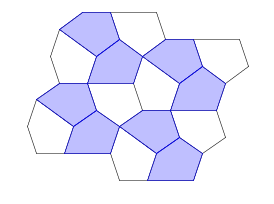 The more ‘complex’ Type 2 is an example of the ‘uncountable infinity’ types of tilings, of which in this instance it can be seen that the tiles tile by means of a par hexagon, with special features. Simply stated, the tiles can be arranged ‘differently’ in the par hexagon, and so thus giving the possibility of uncountable infinity of tilings. Of this type, I show three examples, arguably with the greatest degree of structure. As alluded to above numerous trivial combinations are also possible, but are not shown. Seemingly as ever with matters concerning this tile, this is not a straightforward task! Although I have done much original and innovative work with this tile, and its spin–offs as above, the idea was not mine. The seed for my investigations arose as a result of correspondence with Vincent Kreugel, who sent me a pentagon tiling believing that he had discovered it, being unaware of Rice’s previous work. This took my interest, and upon researching it I found Rice’s own study. Kreugel’s findings include figures 6a, 11, 12, 13. Everything else is my own. Schattschneider, Doris. ‘Tiling the Plane with Congruent Pentagons’. Mathematics Magazine Vol.1, 51, No.1 January 1978. 29-44.See page 32, Figure 3, diagram 20. Also see page 37 Figure 8, which repeats Rice’s tile, although the diagram is poorly drawn.